Whether you currently have Amazon Prime or are interested in signing up for a FREE Trial, you can score almost 1 month of Premium Movies and TV shows for FREE! Amazon Prime is already amazing in its own right, giving members free movies, TV Shows & original series, audiobooks, digital books, photo storage, 2 day shipping, discounts, and music. But, did you know you can also sign up for FREE add-on trials of popular original series and hit movies? 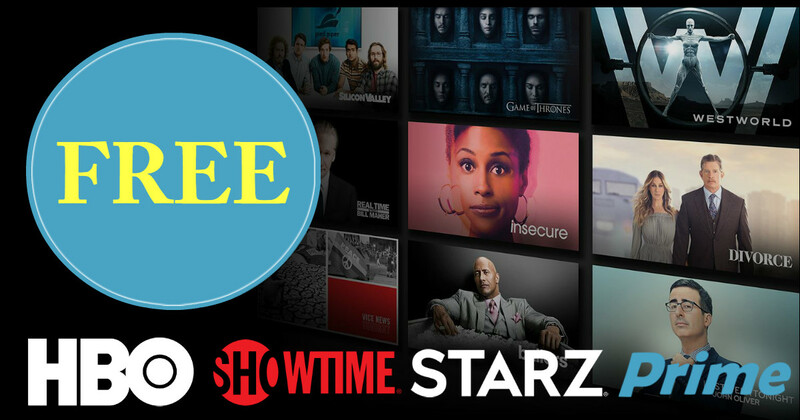 You can sign up for FREE STARZ, HBO, CBS ALL ACCESS, BRITBOX , PBS and SHOWTIME trials, a whopping 42 DAYS worth. You First must be a Prime Member. Already a Prime Member? GREAT, learn how you can score 42 days of FREE Premium TV and Movies right now. You Must be an Amazon Prime member to take advantage of these HOT Freebies. Have EBT or Medicaid? You may qualify. Now that you have prime you can subscribe to HBO to score unlimited access to addictive dramas, hilarious comedies, movie including Game of Thrones, Westworld, Ballers, Silicon Valley and More. You're not limited to the amount of devices you can stream on! Score Hit shows on demand (with 900+ VOD episodes of past and present shows) Plus Exclusive originals and live TV like Star Trek and the Big Bang Theory and The Good Fight. Experience STARZ Movies and TV Shows for FREE for 7 Days. Some of the most popular series and movies include Outlander, Survivors Remorse, DaVincis Demons and More. All of this, for Free and without cable! Sign up for even MORE Popular TV Shows and blockbuster movies with a SHOWTIME Free Trial for 7 days. Included are award-winning Original Series, hit movies, sports, and more. Ray Donovan, Weeds, House of Lies, Dexter, Shameless, Billions and many more are included in this trial. A great option for the kids - with many education shows like Wild Kratts, Arthur and more. You can score this free trial. If you wish to continue it's only $4.99. No cable or satellite account necessary. You can start these free trials all at the same time, or one after the other, giving you 28 days of FREE premium TV and Movies. After your trial ends you can either continue with the service for a low monthly charge of $8.99-$14.99 or cancel at no charge to you. No Risk, Lots of Fun, What are you waiting for? Don’t forget! Join our community of subscribers for the hottest Deals delivered right to your email every day!